“May we ask you to put away your mobile devices for just twenty minutes and allow the lenses of your eyes to appreciate the work, not the lenses of your mobile device,” said Robert Ott, Chair of the Ryerson School of Fashion, as he opened the 30th annual Mass Exodus fashion show. This year’s collections were nothing short of unique, featuring space terrain, a vacuum cleaner impersonation, bridal gowns, accessible clothing and more. This year’s event was also a call to unplug from digital technology, and to imagine a post-digital world, at least for the duration of the show. Mass Exodus is organized by third-year fashion communication students at Ryerson University. It showcases the works of fourth-year fashion design students, introducing them to the industry and the public. One of the most unique collections displayed last friday was ‘Jupeio’ by Karin Meister. It was a kids’ collection inspired by space terrain. “I thought, if we were to travel to a different planet, or do space excavation, what would a kid wear?” said Meister in an interview with CanCulture. 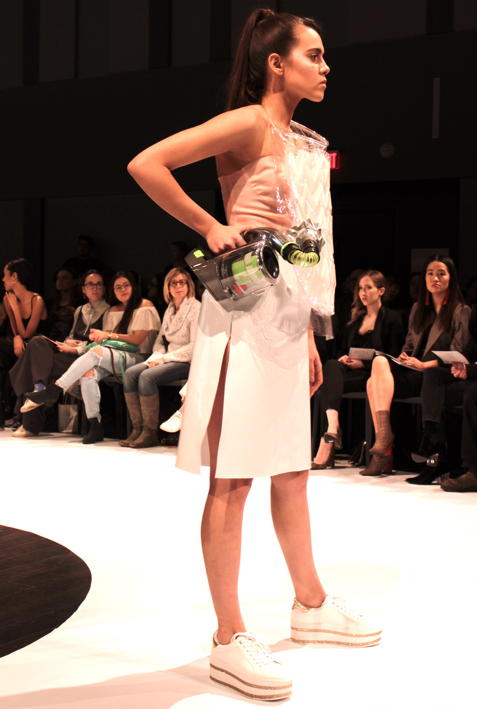 Another collection in this year’s repertoire was ‘Personify’ by Beverly Tse. Through the collection Tse wanted to play with the juxtaposing relationship between the artificial and the natural. “I looked at objects such as suction cups, vacuum cleaners and I kind of realized that, for some reason, I could see a part of myself in them, in a way. I looked at a vacuum bag and how when you take the air out of it, it’s kind of like a human breathing,” she explained. Her designs bring inanimate objects such as a vacuum cleaner to life. Instead of focusing on online research, like some other designers, Tse looked at things around her for inspiration. Her approach fits well into the digi-free theme of this year’s Mass Exodus. Her inspiration also came from wishing to experiment with unusual things she’s never used before. That’s when she ordered suction cups and after cutting them in different shapes began picturing her ‘futuristic garden’ dress. “When I was making these things (suction cup shapes) I realized that I was, in a sense, personifying these materials and making inanimate objects have human characteristics or innate qualities of humans and nature,” she said. That’s how the name of her collection ‘Personify’ was born. A third collection on display at Friday’s show was “I Do’ in Urban Streetwear’ by Melissa Nugara. This collection consists of pieces that a contemporary bride might wear, such as a pant suit. Despite the modernity of the collection, Nugara stuck with the traditional white colour for all of her designs. Lastly, the collection receiving most applause from the audience was ‘Un-form’ by Sonia Prancho. It was designed for young women with functional limitations or physical disabilities, which require an easier way of dressing. “I am pulling away from trying to adapt clothing and instead designing for their bodies and needs,” said Prancho on the Mass Exodus website. Her collection includes elements such as velcro, magnet zippers and full side opening pants, all geared to ease the dressing process. In addition to being an accessible clothing collection, it was modelled by young women with physical limitations or disabilities. Ott’s challenge to unplug from digital technology was well received by the audience. Hardly any screens were lit up as the viewers sat in awe of the designs.